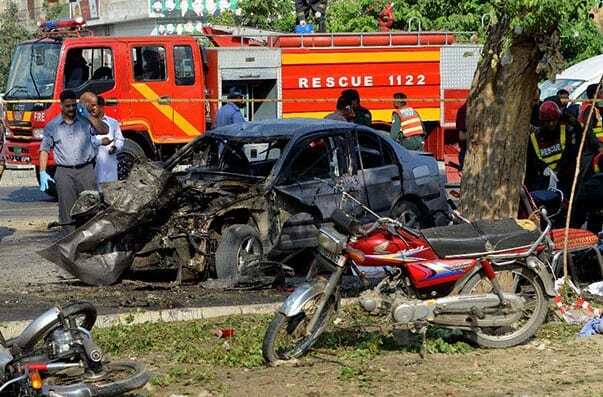 At least 25 people were killed and 57 others have been injured in a suspected suicide blast near the Arfa Karim IT Tower on Lahore’s Ferozepur Road on Monday afternoon. 9 police officers have been killed in the blast. A huge number of people have been rushed to nearby hospitals and 57 are thought to be in critical conditions. An emergency was imposed in the city’s hospitals who are overwhelmed and working at almost 100 % capacity. The explosion took place near the Arfa Karim IT Tower. A very public area of Lahore, busy with traffic and where buses pass every few mins. A busy locality near the office of Punjab chief minister. Several motorcycles and at least one vehicle were destroyed in the explosion. Police and other law enforcement personnel have reached the site of the incident and cordoned off the area. Forensics teams have started collecting evidence from the blast site, after which the nature of explosion will be confirmed. More news as it breaks.